As someone very clever once remarked, just because you can do something, doesn’t mean you should. They were almost certainly talking about something even more important than beer, such as building an atomic bomb or holding a referendum, but there are also plenty of breweries who would be well advised to have the saying inscribed over the brewhouse door in big gold letters. So, I’ll admit it was with a certain amount of trepidation that I accepted – by which I mean blagged – an invitation to the launch of Britain’s very first Trappist beer. 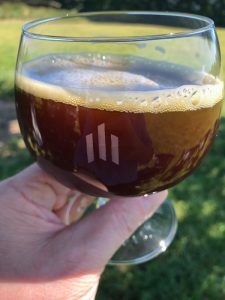 The tradition of monastic brewing goes back at least as long as there have been monks, and in fact beer’s links with religious rituals predates Christianity by millennia. There are eleven Trappist breweries worldwide – six of them Belgian – currently allowed to sell beers with the Authentic Trappist Product seal of approval. The beers are much admired by beer aficionados, so there was considerable interest when the news came out a year or so back that that the Mount St Bernard monastic community in Charnwood Forest, Leicestershire, would become the twelfth accredited Trappist brewer. We, as in a group of beer writers and a smattering of local media, rocked up at Mount St Bernard on a gloriously warm July day at the invitation of James Clay, the leading craft and specialist beer distributor, which is distributing the beer. The details – not only the style and flavour of the beer itself, but also the name and branding – had been kept a secret. My niggling worry, I’ll admit, was that we might end up tasting a beer that was trying a little too hard to be an authentic Trappist beer in the Belgian style, and would end up missing an opportunity to celebrate the British monastic brewing tradition. I needn’t have worried – but more of that in a moment. We were greeted at the implausibly tranquil and scenic Mount St Bernard by the Abbot, Father Erik. 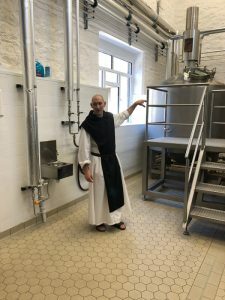 He explained that all Trappist communities have a duty to be self-sustaining and, having taken the decision to exit dairy farming five years ago, after some debate the monks voted to have a crack at brewing. Planning permission was obtained, and buildings that formerly housed the monastery’s kitchen, refectory and laundry now contain a 20 hectolitre brewery, kitted out with modern German-specced brewing equipment, as well as a bottling line. Before the grand unveiling of the beer itself, I had a chat with Father Michael, the head brewer, who was very clear that they had been determined all along to come up with a Trappist beer that brought something different to the party – and reading between the lines, it also seems clear that other Trappist brewers were keen that their British colleagues complement rather than compete with the existing beers. Father Michael took his time creating the recipe and comparing it with existing brews, as evidenced by the range of empty bottles in the pilot brewhouse; everything from Belgian classics to premium British ales and beyond. Among those the monks consulted for advice were the great Steve Wellington, former Master Brewer at the William Worthington’s Brewery in Burton-on-Trent, and Dutch master brewer Constant Keinemans, who sits on the quality commission of the International Trappist Association. And so to the reveal: The new beer is called ‘Tynt Meadow’, named after the field on the monastery site where the monks first settled in 1835. The official tasting notes describe the beer as having aromas of dark chocolate, liquorice, and rich fruit flavours; full-bodied, and gently balancing the taste of dark chocolate, pepper, and fig. I’ll go along with that – to my palate, the fruit flavours are on the dark side, with raisin and blackberry prominent. Enjoyed over lunch in in Tynt Meadow itself, the beer matched beautifully with strong blue cheese and spicy gingerbread. 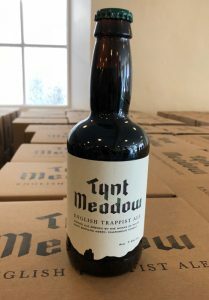 Just as importantly, at its heart, Tynt Meadow is a quintessentially British ale, and as such thankfully adds a welcome new dimension to the Trappist beer landscape. The beer is brewed with English barley and hops, and an English strain of yeast. It is twice-fermented, with a second fermentation in the 330ml bottle. In style terms, the official guidelines may need to be amended; to my mind Tynt Meadow falls somewhere between a strong brown ale and a barley wine, as well as being reminiscent of a traditional strong porter. It’s definitely a gastronomic beer, at 7.4% ABV one to savour slowly at the dinner table rather than to quaff at the bar. Mike Watson, head of marketing at James Clay, describes it as “a huge milestone for the UK beer scene,” while Father Erik says “being the first active Trappist brewery in the UK puts us in a really good position to bring something truly special to consumers across the country and we feel honoured to be at the forefront of this. All proceeds from the beer will go towards the upkeep of Mount Saint Bernard Abbey and towards charitable works – when you have the opportunity, it’s well worth trying.